The last couple of days have been rather hot, at least where I live, so you kind of have to keep the windows open to survive in the heat. However, when your windows are open you tend to get a lot of unwanted visitors flying or crawling in which is disgusting. Last night I was startled by an enormous moth zipping back and forth in my apartment. Uninvited. A fight to the bitter end ensued. After hours of fighting, hiding, and then fighting again, I emerged victorious (as you'd probably figure out). Afterwards I continued writing my previous blog entry. But the whole incident reminded me of a certain lyric: "I can tell it's summer from the / size of the bugs that fly through my window / Flying through my window". It was all painfully relatable last night. The lyrics come from a song called "Rusted Wheel", that appears on an album named Carnavas, that was released by a band named Silversun Pickups. Not only is Carnavas a great album, but it's also a sensational debut album. I've done a lot of thinking regarding debut albums and how they often end up being among the best work of nearly any bands out there. An exceptionally good debut album is unfortunately often succeeded by a not-quite-as-brilliant second album. It's hard to first create something extraordinary and then duplicate the success with an at least equally brilliant effort. There's even a specific term for this phenomenon: Sophomore slump. All of this made me list some of my favourite debut albums, which I'm introducing and reviewing through a series of articles. Expect music from great bands at their rawest, at their freshest, at their most innovative. Thank you, Mr. or Ms. Moth: though you gave me horror, you gave my inspiration as well. And in order to respect my fallen muse the series will be started off with Carnavas. Released in 2006, Carnavas is the first LP (although not the first recording) of the L.A.-based Silversun Pickups. The band, formed in 2002, released their debut album to generally positive reviews. The album itself peaked at #80 on Billboard 200, while the singles "Lazy Eye" and "Well Thought Out Twinkles" peaked at #5 and #9 on the Billboard Modern Rock chart, respectively, later appearing in Rock Band and Guitar Hero games. Silversun Pickups' shoegaze sound has quite often been compared to that of The Smashing Pumpkins and not without a reason: there is something very similar in the vocals, in the way the guitars are used, in the way the songs sound. Brian Aubert's occasionally soft, occasionally screaming vocals are reminiscent of Billy Corgan's emotional way of singing (especially on songs such as "Lazy Eye"), and the songs are drenched in a wall of sound created by the guitars. There is a fine line between being inspired by someone and plagiarising them, but while the influence is notable, the band does have their own thing going on. While Band of Skulls' indie rock sound was bluesy, Silversun Pickups' music leans more towards the 1990s alt rock sound which also explains the occasional similarity with The Smashing Pumpkins. (It's good that they use the abbreviation SSPU, otherwise they'd even share initials with the band in question!) Yet, the music is much more than grunge and angsty riffs played in flannel shirts. From the big opener "Melatonin" to the uptempo album closer "Common Reactor", the group showcases their talent and still somewhat unique sound on a variety of material. 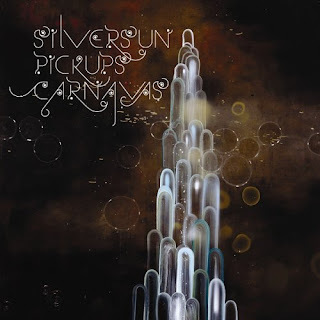 The band has released three albums to date, but like quite often with debuts, Carnavas is Silversun Pickups at their best. Take the aggressive but melancholic "Well Thought Out Twinkles", for example - one of their best moments so far - or the dreamy "Checkered Floor" and the previously mentioned "Rusted Wheel". Other highlights include "Waste It On" with its delicious amounts of bass guitar - it's all very 90s rock - the emotional "Three Seed" and "Dream at Tempo 119" that starts with an intro that could be a character theme from Doctor Who. I kid you not. Silversun Pickups is an album-oriented band which is audible from their material: their singles are great, but so is the rest of the album - no fillers here. It's almost funny how nostalgic yet fresh this music sounds. Like the band introduced previously, Band of Skulls, SSPU might not be revolutionising rock music, as they both draw influences from the past, but they're both creating distinctive guitar-driven music that sounds fresh and still somehow new. Do yourself a favour and give the record a spin. Try at least: "Well Though Out Twinkles", "Lazy Eye", "Rusted Wheel", "Checkered Floor"